Cacti and succulents are seriously trending right now. Their astounding variety and elegant architectural forms are calling us in droves to the “green” side, including those of us who, err, don’t exactly have a case of the green thumb. These gorgeous plants aren’t just a pretty face, though, they’re dry-hardy, low-maintenance and, very easy to grow—music to our ears! So why do so many people struggle to keep them alive? Lack of basic knowledge, for a start (anyone remember taking “gardening” class at high school?). But, there is a lot of dodgy information out there too, so let’s start by dispelling some of these myths. We’ve picked the brains of professional green-thumb to bring you all you need to know to keep your succulent or cacti alive. Succulents and cacti need direct sunlight. Say it with us again, succulents and cacti need direct sunlight. The indoor plant trend of late touts the ease of growing succulents indoors, when in reality these guys need those rays. So, make sure your succulents have a super sunny spot to keep them thriving. 3-6 hours a day is all it takes, but be warned though, any more than 6 hours could leave you with sunburnt plants, so try to position them where they’ll be in shade, too. Signs your plant-baby may need more sunlight are weak, elongated limbs and a loss of colour. 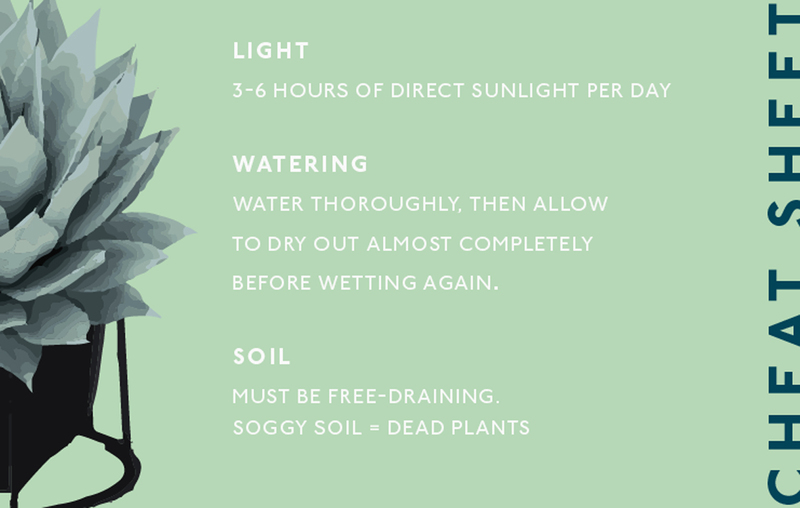 Most cacti and succulents need minimal water. In fact, most can survive on natural rainfall alone. However, what you need to understand is that plants in tiny little pots need more water than those planted in the ground. How much light you give it will also determine how much water it needs, as does temperature. The rule-of-thumb for most succulents is to water thoroughly, then let them dry out before soaking again. Too much water, especially in our humid summers, will see the plant start to rot at the base. A week of heavy downpours followed by hot, humid conditions is a recipe for bacterial and fungal infections #AintNobodyGotTimeForDat. Cacti and succulents generally do best in a specialist potting mix. This mix usually contains a high proportion of grit and perlite, ingredients that make the soil light and airy and able to drain rapidly. While many succulents can be grown in regular potting mix (e.g. Echeveria, Euphorbia milii), if you’re in any doubt, use a specialist mix. Recently we’ve noticed quite a few succulents arriving from our suppliers in the southern states potted into pure coconut fibre (coir). Coir is usually given to thirsty tropical plants that don’t like to dry out, so it’s an odd choice for succulents. If you have a plant that’s potted into coir, you’ll need to be especially cautious of over-watering. Similarly, if you have succulents planted in the ground, make sure the soil isn’t becoming boggy after rain. If you find the water is not getting away quickly, you’ll need to either improve the drainage or find a different spot to plant them. Not all cacti and succulents grow well in sub-tropical cities such as Brisbane and the far north. Our sticky and humid conditions can be a bit much for species that like a dry Mediterranean summer. It can be tricky to pick, so make sure you do your research. If you follow the basic rules we’ve outlined here, you’ll be a pro in no time. Just remember: anyone who knows anything about plants has killed hundreds of them in their time! Don’t let a few deaths dissuade you—learn from your mistakes and have better success the next time! Wish you had the green thumb? Check out our guide to indoor plants for serial plant killers.